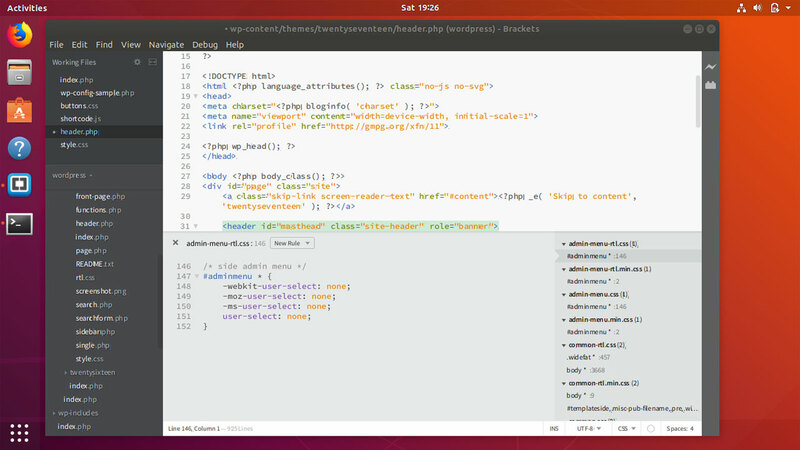 This tutorial explains how to download and install adobe brackets code editor on Ubuntu 18.04 desktop. To install Brackets, first we need to download the deb installer from the brackets website. Log in to your Ubuntu 18.04 desktop, open a web browser and navigate to http://brackets.io/. Click on the download button and download the latest deb package. After the download has finished, right click on the deb file and click: Open With Software Install, then the install button. There is an alternative method to install brackets on Ubuntu 18.04, That is to use snap package manager. One advantage of the snap package is, it will update the the brackets to newest version automatically when a new version is available, on the other hand deb package is more stable than the snap version. Brackets code editor has a lot of interesting features to help professional web developers, such as Inline code editing and Live preview.